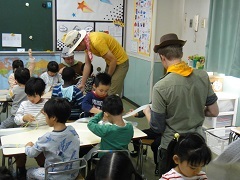 The Standard Immersion Day ‘Camp IYK’ held today was a great success! 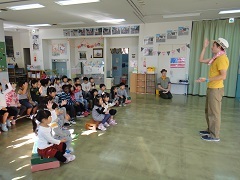 All of the children had so much fun and did a fantastic job listening to English instructions and answering questions from the Overseas Teachers. After a short playtime we had a short teachers play where the camper wanted to go to Camp IYK but was too scared of bears. After making lots of friends, including the friendly bear, we went to make Camper Sashes to hold all of the merrit badges we earned throughout the day. Everyone did so well sewing, cutting and sticking to decorate their craft. 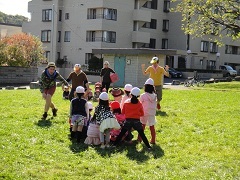 We then went to Kusabue Park and played a really fun game from New Zealand where the children had to take coloured ‘eggs’ away from crows. When we got back to IYK we had a phonics challenge from the friendly bear. 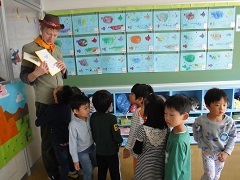 The children had to collect picture clues and work together to spell and read the English phrase. All of the teachers were very impressed with the childrens spelling and vocabulary understanding. 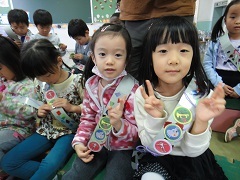 During lunch the children drank ‘Insect Juice’ then before returning home it was time to get their final badges to put on the sashes. 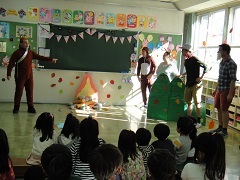 Today was lots of fun for the children and teachers with everyone trying hard and showing the Overseas teachers they do not usually have much time to play and talk with just how good their English abilities are. Well done everyone!